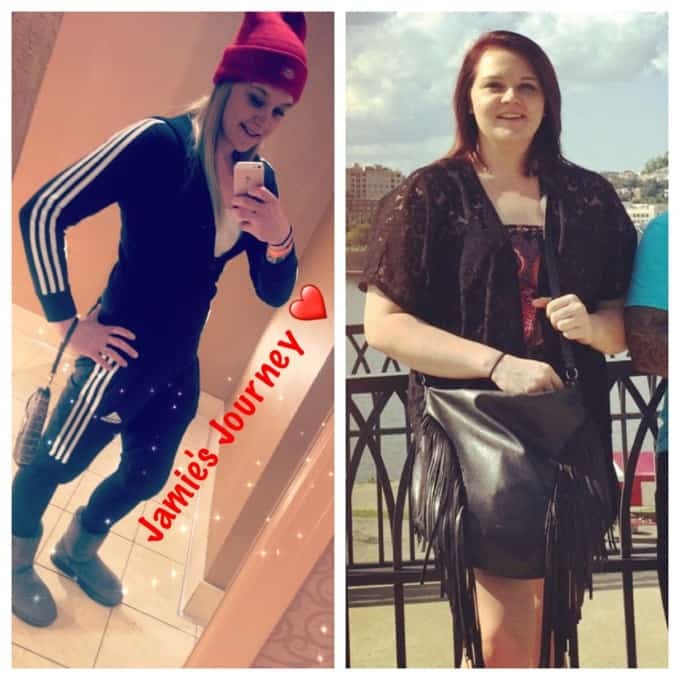 Home » Weight Watchers Recipes » Weight Loss Success Story #59 – Jamie J. 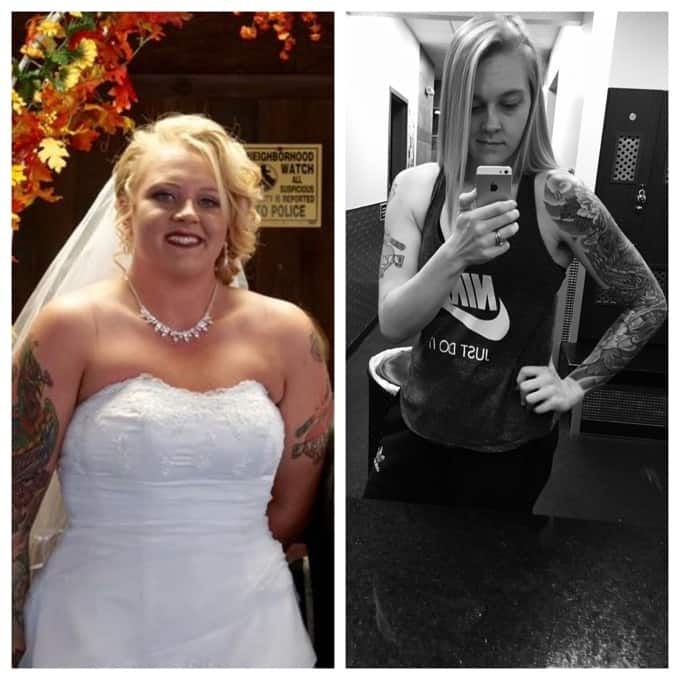 Weight Loss Success Story #59 – Jamie J. 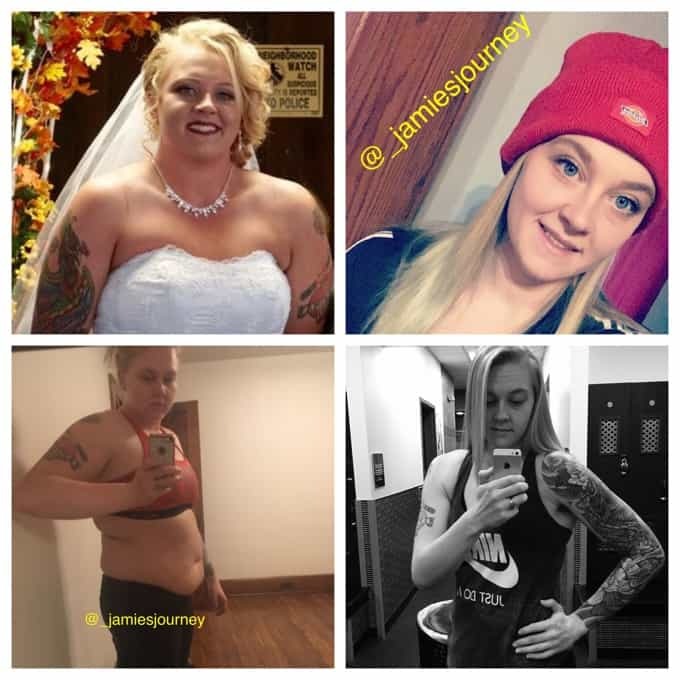 Weight Loss Success Story: Jamie J.
I’m happy to be sharing another inspiring weight loss success story with you here on the blog today. 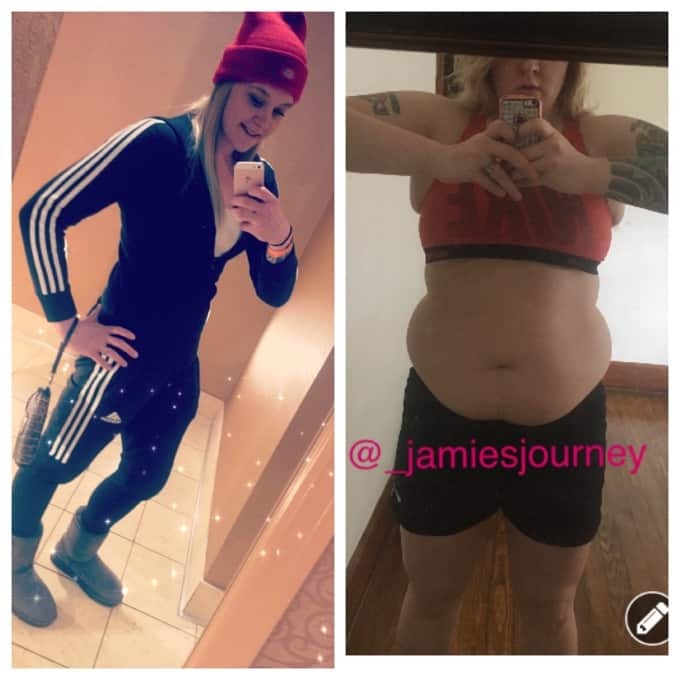 Jamie J. has become fit and strong while losing 70 pounds…. I had been overweight for as long as I can remember. I always wanted to lose weight, but never had the drive and the determination to stick to it. I would always wear big sweatshirts and sweatpants so that in my mind, I knew that I was overweight, but I didn’t look like it that much to other people. I remember doing a lot of things like this throughout the years, just trying to cover up what the problem was instead of acting on it. I started my journey on March 10th, 2017—for probably what was at least the 1,000th try. I used to wake up every day and say “today’s going to be the day,” only to find a million excuses to start tomorrow. I have tried all different kinds of weight loss products before in the past that claimed to work, but never did. I have been overweight for as long as I can remember. Food was always my go to and I found myself eating even when I wasn’t even hungry. I always thought about losing weight and how wonderful I would feel—and look—after, but just couldn’t get myself to care enough to actually do it. Then on this day, March 10th, 2017, a day that I will never forget, it was as if I woke up that morning and everything had finally clicked. I woke up that morning and decided to go running at the gym that I had been paying for for months, but never went. So I went that day, and I pushed myself to run 2 miles. Something I had never done before. After I was finished at the gym, I couldn’t get over the feeling and energy my body had found. So on that day, I stopped drinking coffee. Tim Horton ice caps were always a part of my daily routine, before this day. I also went to my local supermarket that day and picked up some chicken and vegetables. I went home after that and decided to “give it one week” to see if I could do it. Since then, I haven’t looked back. The weight started melting off and every day when I go to the gym, I push myself to go farther and faster than yesterday. Now, here I am over 70 pounds down and finally living my life the way I should have done years ago. I work in a Japanese restaurant so I am always surrounded by food. Before I would grab anything fast or anything around me, not caring about how healthy the food actually was for me. Now every time I eat, I am more aware of what I’m eating and I have now learned how to use food as fuel, instead of just indulging. Before, I had a gym membership but never went and if I did go, it was maybe once every two weeks. I would walk on the treadmill (affiliate link) for maybe 10 minutes then quit. Now, I go almost daily. I run now, a lot. I can run 4 miles in 30 minutes. I lift weights and I do HIIT intervals. I always thought the biggest payoff would be the physical change, but I was wrong. My mentality change has topped any physical change.I have found confidence and a desire to work out. I enjoy it actually. I look forward to going to the gym. Now, I want to help other people that have struggled—and are still struggling—with the same thing as me before. Chicken breast, or lean turkey, with steamed veggies are my go to! I have lost about 69 pounds since I started using the scale. 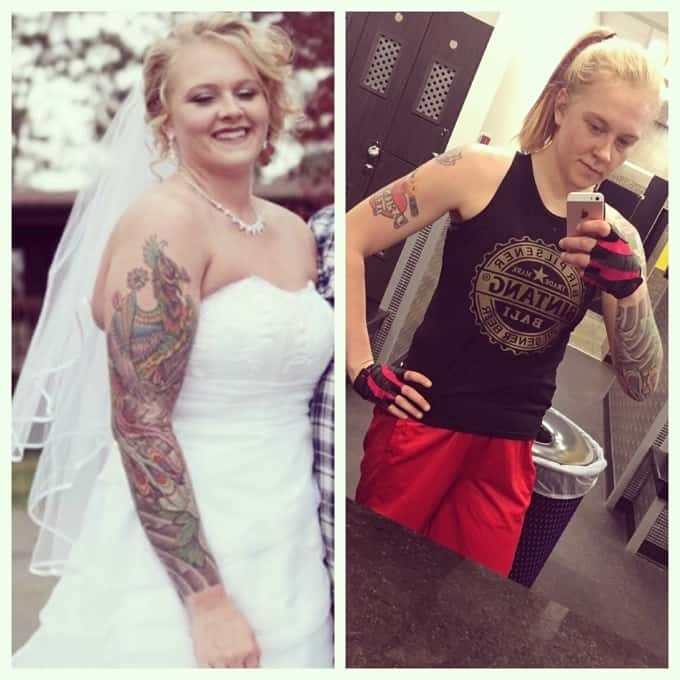 I believe there may have been 15-20 before then, while I was preparing for my wedding, but I didn’t use the scale then. I officially started on March 10th, 2017, so almost a year. Set a goal for the day when you walk into the gym. Either aim to be faster, stronger or achieve more distance, and don’t leave until you achieve it. Also once you start losing weight, it seems easy. It’s normal for your weight loss to slow down somewhat, as you start to get closer to your goal. Don’t give up, you’re probably still losing inches and gaining muscle. Make it a lifestyle change, not a quick fix. This is hard to believe because in the first picture her arms (right) have different tattoos.?. Is one a temporary one/. Congratulations on the weight loss! I know, I’m having a very hard time reconciling the tatoos on different arms! Is one in mirror maybe? Negative was flipped in the bridal photo? I can’t focus on the story. LOL.